When the very first art teacher commanded the very first art student to learn anatomy, it began a long, long search for shortcuts. Thousands of years later, art history is still littered with failed attempts at shortcuts on anatomy. Artists have tried concealing their ignorance by using heavy shadows or excessive random lines or a soft focus. They have tried concealing hands in pockets, or cropping pictures to exclude difficult parts, but their weakness shows through. Kirby invented his own version of anatomy, and while it is often inaccurate, it seems just as persuasive as the genuine anatomy found in Bridgman, Vesalius or Muybridge. Kirby's muscles don't connect properly-- he confuses the deltoids and the pectorals, his elbow wouldn't function, and his squiggly lines don't describe any known anatomical purpose. Yet, this remains a powerfully convincing drawing. And that's the way it is with Kirby; there is a confidence and virility to his figure drawing that repeatedly powers him through awkward anatomical questions. I don't know whether Kirby actually understood human muscles, bones and tendons, but his work reminds us that the right attitude can enable artists to get away with expressive liberties that other artists cannot. This is brilliant. I love Kirby and realized that for some reason I just couldn't ape his style when I was first learning to draw. For some reason it never dawned on me that it was a bit inaccurate. I really like his squared up hands and fingers! It's so cool that you found both drawings of the arm in the same pose. Really drives home the theme. Surprising how few academic guys used Z-space. I think I disagree with the thesis being presented here. Certainly, Kirby is using a shorthand, loose way of suggesting anatomy, but I think that shorthand is based on a reasonable understanding of real anatomy. In the image of Etrigan used, the strong diagonal running under the top of the deltoid seems to be a representation of the coracobrachialis diving between the biceps and the triceps. That squiggly line could be the inferior border of the long head of the triceps. In some ways, Kirby's representation of anatomy is clearer and less confusing than the Bridgeman student drawing you compare it to, which is made more impressive due to the fact that the academic study was done from direct observation while Kirby was probably working purely from imagination. All the Kirby drawings in this post seems to have an at least plausible enough rendering of the basic large muscle groups. While they're not perfect, they're more believable and correct than the muscles seen in a lot of contemporary comic book pencillers. Also, we find plenty of artistic liberty taken with anatomy in the work of "more serious" artists like Rubens and Michelangelo. If anything, I think this post makes me more appreciative of how great Kirby was at portraying the real structure of the human body in a simplified, but functional and dynamic, way that was perfectly suited for the simplified, dynamic world of his art. I can't say I'm convinced by the Kirby works you included, but I can't wrap my head around what anyone sees in a Kirby but their own adolescence anyway. Speaking of Bridgman, do we know how much of Bridgman's work was more purely from his head (besides the blocky anatomy illustrations), and what was from life (likely the two drawings you included)? Would help in gauging just how much anatomy he knew by comparison. To make an extreme form of the argument, I went to school with a number of kids who could create some hyper-realistic graphite drawings from photo, but I wouldn't accuse any of them of knowing any anatomy at all. whenever perusing my little collection of old comics as a kid, I always thought the anatomy on this Kirby drawing was particularly odd. Captain America's hips seem to be oddly proportioned- wide, but very shallow, like his buttocks had been sliced off. In the larger flow of the page, you don't really see it, because the surrounding drawings are so good, but this panel used to seem glaringly wrong by comparison. Gil Kane once remarked that he preferred Kirby's earlier figure drawings because then he was drawing the figure, but later, he was doing "an impression of a figure." I think "impression of a figure" captures pretty well what Kirby was doing, and presumably, his intent. James Gurney, if you're looking in, what's "Z-space"? The term is new to me. Bob, by "Z-space" I mean drawing parts of the pose near or far from camera, in the "Z" dimension, rather than the X-Y dimension, flat on the paper. Fist in the Face!! Marvel Way to Draw got into that, of course. Kenney Melcher-- yes, those oversized Kirby hands-- big, blunt squared off instruments-- weren't well suited for poets or surgeons, but were an ideal stylistic exaggeration for an artist specializing in super heroes. James Gurney-- Good to hear from you, Jim. Yes, I take your point about Z space. I suppose they still had a lot to learn about mastering 2D space (including details of what goes on beneath the surface-- something which many artists later concluded they could do without). No sooner did we became accustomed to thinking in static Z space than our pictures began moving and talking in 3D. What new brand of steroids will we come up with next? Humbucker-- A few weeks ago on this blog I defended Picasso's use of unrealistic and exaggerated anatomy. I wouldn't cut Picasso any slack that I wouldn't also give Kirby. Personally, I think you're being generous in your interpretation of Etrigan's deltoid and coracobrachialis (I suspect you were closer to the truth with "a shorthand, loose way of suggesting anatomy"). But we don't need to debate that drawing-- if we look at one of the drawings I describe as spectacular failures, I think they are indefensible as "based on a reasonable understanding of real anatomy." That right arm is a bunch of convex squiggles to denote power, unconnected to human anatomy. (How do you account for that horizontal line?) I'm not saying that's a bad thing-- rather, I'm impressed that Kirby gets away with it because of (as you put it) the offsetting value of the "simplified, dynamic world of his art." Many artists trade the discipline of representational drawing for something else. For some, it's watching football games or having fun surfing the internet. Those slackers are easy to spot. Picasso traded realism for other effects that were incompatible with a tightly drawn, accurate pictures. It's possible that Kirby did understand anatomy but traded it for the potency of comic book drawings. It's up to the viewer to determine whether what they receive in exchange is worth the trade off. Richard wrote, "I can't wrap my head around what anyone sees in a Kirby but their own adolescence anyway." Simone Weil wrote a famous essay on Homer's Iliad in which she said, "The true hero, the true subject matter, the center of the Iliad is force." 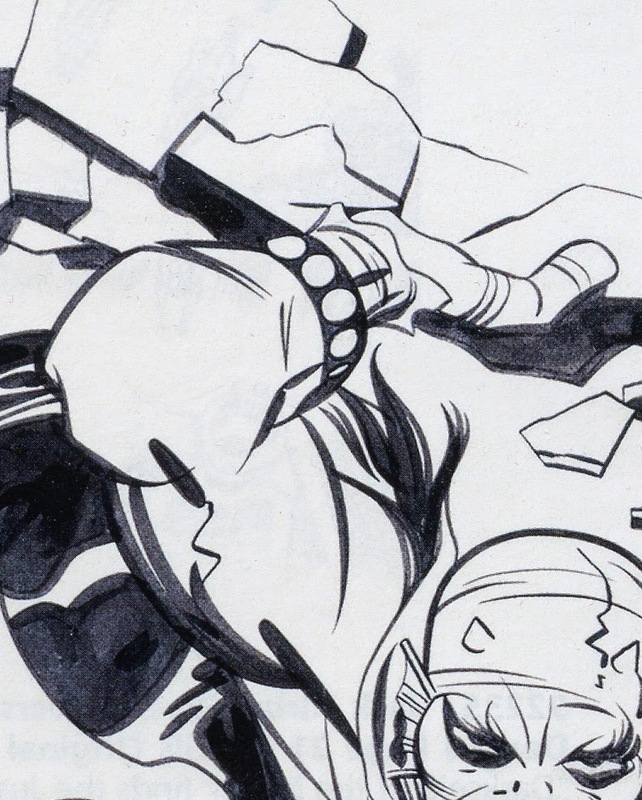 That for me is the center of Kirby's art as well-- his whole distorted anatomy is geared around that. When you want to see the wrath of Achilles you ain't going to turn to Chester Brown or Kate Beaton. For an excellent, funny, lively discussion of Bridgman's values and teaching techniques, I strongly recommend Norman Rockwell's chapter on Bridgman's class in "My Adventures As an Illustrator." The jerk-- I see your point, but I would also be interested in what you describe as "the surrounding drawings." 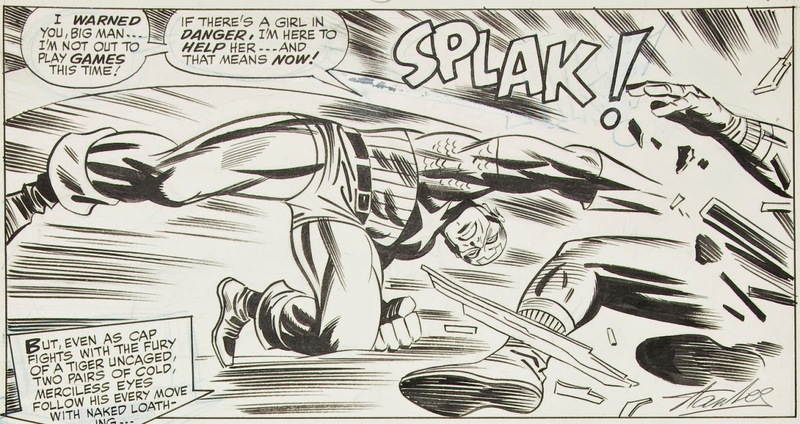 As an artist of force and movement, Kirby made some compromises in individual panels as a springboard to the next panel, or to engineer a total composition. Anonymous / Bob Cosgrove-- I agree with Gil Kane's reasoning but come to the opposite conclusion. Kirby did "draw the figure" in his early years and I think those drawings were pretty mediocre. Later when he started drawing "the impression of a figure" I started liking his work much better. 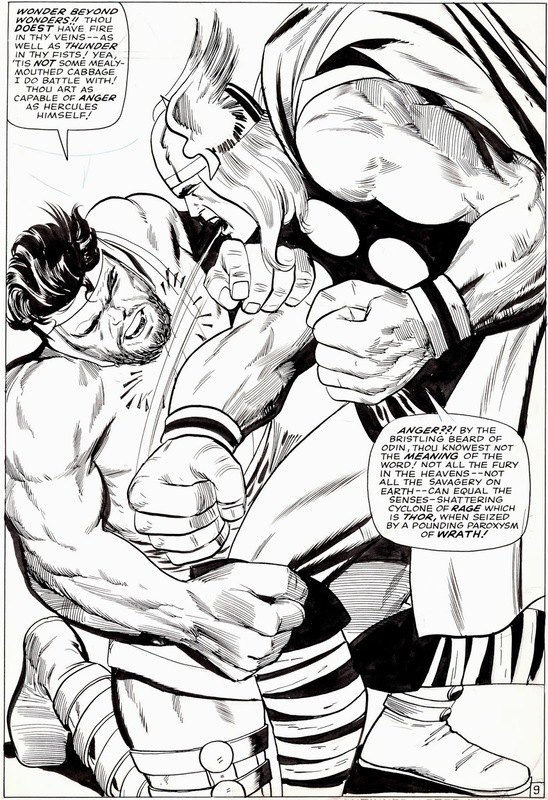 Even if Kirby couldn't properly connect a pectoral to a bicep, his bold, confident "impression of a figure" could be quite distinctive and impressive. Jack Kirby is pretty easily among the top 5 cartoonists of the century, likely ever. 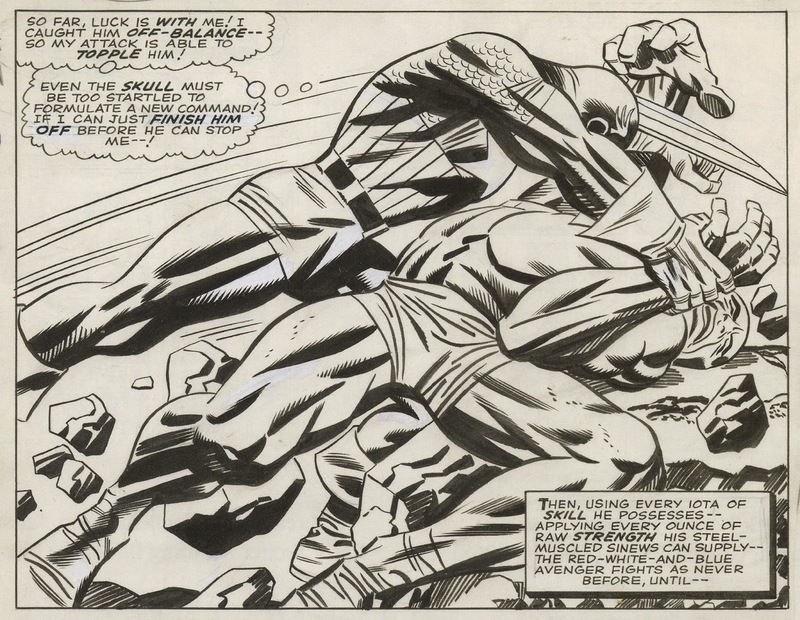 Jack Kirby always communicates the spirit of muscles, force and tension rather than the letter, so to speak. Even his failures are correct according to his own principles of force. To examine Kirby's work purely on it's accuracy is to completely misunderstand the point. An analogy would be how in films characters never go to the bathroom, or often eat. We skip these, and many other tedious scenes in narratives in order to effectively deliver a point and stay on task. Kirby does this more effectively with action than any other artist. Not only that, in my mind i've always thought of his attention to ACTION rather than 'muscles'as an excercise in humility. In comics, when so much is about power fantasy, Kirby's approach forces the viewer to shrug off the approach to the comic where one says, yeah that's how I want to look. Instead, it becomes, yeah thats how i want to act/be. Lastly, Regarding your two 'failures'. I actually don't take issue with the Orion drawing, aside perhaps from the line between the bicep and the tricep. you are seeing the underline of the bicep because he is raising his arm higher than the viewer. Regarding the last one, I couldn't believe my eyes when I saw a Vince Colletta drawing on this blog. Colletta is widely known for not only using underpaid assistants, but also wholly ignoring/changing parts of Kirby's pencils. On the Eternals, Jack actually specifically didn't want Colletta inking his drawings when he found out Colletta was doing this. Even so he felt really bad, always asking how Colletta was doing and whether he was getting work. Placing his artwork above Collettas families need was not something he was about, but eventually he realized how Collettas sloppy inks were harming his own marketability. 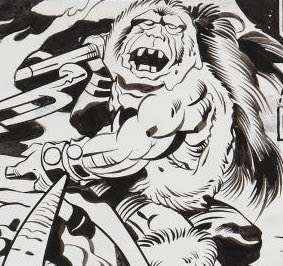 for a 100% faithful inked version of Kirby's pencils, look no further than Mike Royer. He stuck 100% to Kirby's pencils, weird stuff and all. I will note that I think that by the time Royer got to Kirby, he was already going a little wonky. It's likely his prime was in the late 60's, when the fire was put to him to save Marvel from bankruptcy. I'll just leave with saying that there's more to Kirby's work than attitude IMO. Kirby understood power, be it kinetic, potential, mechanical or emotional, thats what he DREW. The speed he was putting out work (3 pages a day at his SLOWEST) he didn't concern himself with the niggling details of Hogarth-ian anatomy. He wanted to render power as it related to the narrative. not only that, but one has to allow for the fact that Kirby rendered things successfully that Bridgeman for instance likely would have buckled or spent long hours of research. Metal skin, fire muscles, hair tendrils that can pull, a time warping teleporting bull dog. He drew many things convincingly all the while coordinating it with a larger style. 1 approach for many subjects, which IMO is a respectable aim. It speaks as one perspective on life, rather than a fragmented or relativistic interpretation of it. Btw, love the blog. Keep posting and thank you. All you have to do is backtrack through Kirby's earlier (Pre: Fighting American) work to know that A: He did know Anatomy B; The Kirby we all know and love was 20 years into his career and had figured out a shorthand that allowed him to work quickly and give his work a sense of energy alot of other creators lack to this day. Conor Hughes-- I will let others calculate whether Kirby was "among the top 5 cartoonists of the century." He was certainly very important to the comic book quadrant of the cartoon industry. But when you say, "To examine Kirby's work purely on it's accuracy is to completely misunderstand the point," I thought that was the one thing I wasn't doing. I was saying that Kirby's inaccuracies were offset by other redeeming features, which I think is a very rare thing. Usually when an artist gets anatomy wrong we mentally categorize them at a particular level. But with attitude and gesture and his "impression of the figure" Kirby persuades us that accuracy is secondary. What interests me on this post is what set of conditions persuades us to forgive the artist. As for the drawing of Orion, I am sorry but I think that is one awful drawing. The same with the drawing of Thor and Hercules. You might easily persuade me that an artist as prolific and underpaid as Kirby is entitled to some clinkers but you'd have a real hard time persuading me, regardless of the inker, that those are anatomically accurate or even passable. Finally, it would be hard to find someone who disagrees that Kirby's drawings understood power but you're probably the first person I've encountered who thinks that Kirby's drawings understood emotion. They have the emotional range of the Hulk (but that's OK). Jamal Igle-- Kirby's work pre Fighting American shows me that Kirby "knew anatomy" in the sense that most people have two arms, two legs and one head. But that was enough to get by in that era. I really like the period when Kirby "figured out a shorthand that allowed him to work quickly and give his work a sense of energy a lot of other creators lack to this day." For me, that period when he took more liberties is the period when he became excellent. You're correct that the overall flow of the page allows compromises to be made in individual panels. In this case, he's establishing a series of quick cuts to illustrate Cap's quick acrobatic movement through the room that has been rigged by The Trapster. I'd personally even go so far as to say Kirby among my top 5 artists ever, but i agree his place in the history books isn't part of the discussion. As regards your point 2, I wasn't explicitly stating that your argument was such, but rather responding to what was the general feeling I had from the comments. Nonetheless the leading prong of your assessment (it seems to me) is that in spite of his inaccuracies Kirby is good. I would say that it is Kirby's 'inaccuracies' are what make him great. It is not 'conditions' that make us forgive him, in my mind, but that he convinces us that there is more to life than (what eventually becomes, esp in comics) egotistical replication of reality(e.g. Rembrandt vs Vallejo(tho Boris does have his charms)). Not only that Kirby demonstrates often a superior understanding of the mechanical aspects of the body as well as an ability to articulate that body ANY way he saw fit, without any reference of any kind. For every janky choice is 100 many experienced draftsmen couldn't replicate. Kirby's work is a tour de force in raw drawing power, where rather than wasting time on superfluous rendering, as many modern commercial artists do today, he communicates simply, effectively and with force. Regarding the 2 offenders, I still refuse to acknowledge the Colletta drawing. He is well known for actively not following Kirby's pencils, any discussion of Kirby's drawings with Collettas embellishments is completely worthless. I really don't have a problem with the Orion drawing, and actually find others you have chosen in the post to be worse offenders. Side note: it's underhanded to put up convention drawings as examples of his work. Again the fact is he is drawing things from crazier angles than any one else faster than any one else. The lines on Orions body communicate to me the lats. Sure he ignores the underplane of pec, but arguably the character is lifting the muscle and thus flattening it out. Kirby emphasizes muscles and de-emphasizes them constantly to support the action--->narrative. Many artists whose talent resides in the more 'accurate' depiction of the human form wouldn't accomplish such a thing without 10 photos and 10x the time. I would disagree on the point of Kirby's emotional spectrum. I know you aren't saying this, but in general there is a feeling that sketchy lines or mushy colors are the accepted method of communicating emotion, which I find to be rubbish. Thinking of this reminds me of Daft Punks song by title emotion. Look at FF issue 51 by Kirby to see him tackling emotion other than "me smash". The Thing is a hero, but he's an outcast and ultimately unable to have the one thing he desires. Kirby's panels in this issue communicate this emotion. Perhaps it's a personal thing, but contemporary works that people hold to communicate emotion (Blankets) don't feel like real emotion to me, but rather are examples of feelings of feelings. They are neither raw nor real. Kirby's early work displays bravado drawing skills. It's hard overall to judge his early work because often there are no pencils left and as such we are left with inked versions. Since Kirby rarely inked, and some that were inked by him are unmarked, it's tough to judge his early capabilities by them alone. Sometimes he even simply had his wife Ros ink his work, who had no prior experience with inking. Joe Simon is pretty good, but definitely is like pairing a wild man with another wild man at times. Later examples of the work, which you enjoy, were generally inked by 3 separate people. In doing 3 issues in a month, those 3 issues would be inked by 3 (or more) different artists to keep up with the deadlines. Therefore it's from the same period of work that you enjoy that for instance your Thor image comes from, offering some proof again as to the invalidity of judging his work based off of Collettas inks. My points ramble perhaps but I'm discovering new reasons for liking Kirby's work even more with this discussion, and, if anything, is hopefully continuing the discussion constructively. I hope we can continue it. This is a nice post. Kirby though was a great comic book artist. The drawing style of his best years was like that: abstract, not realistic at all. But that's what comic book drawing requires. Ii is not a mere representation of human bodies, but there's way more to deal with ACTION, GESTURES, and EMOTIONS of those characters. It is a narrative way of drawing, through poses, the gestures, composition on the panels, emotions through body language and facial expressions, mood, rather than a mere representation. Also a complex and more accurate drawing, rich of details often blocks the reader, because he/her ends up focusing too much onto the surface of drawing rather than reading. Of course, there are alot of artists showing complex and way more accurate drawings than Kirby and doing that with success anyway, BUT just look from who many of them took the initial inspiration, and in marvel comics, it was Kirby work showing them the right path. Notice this is very valid but only for comics and also that Kirby style is actually a point of arrival, not a starting point if one wants to become a good artist. He arrived there after many years of work not since day one. 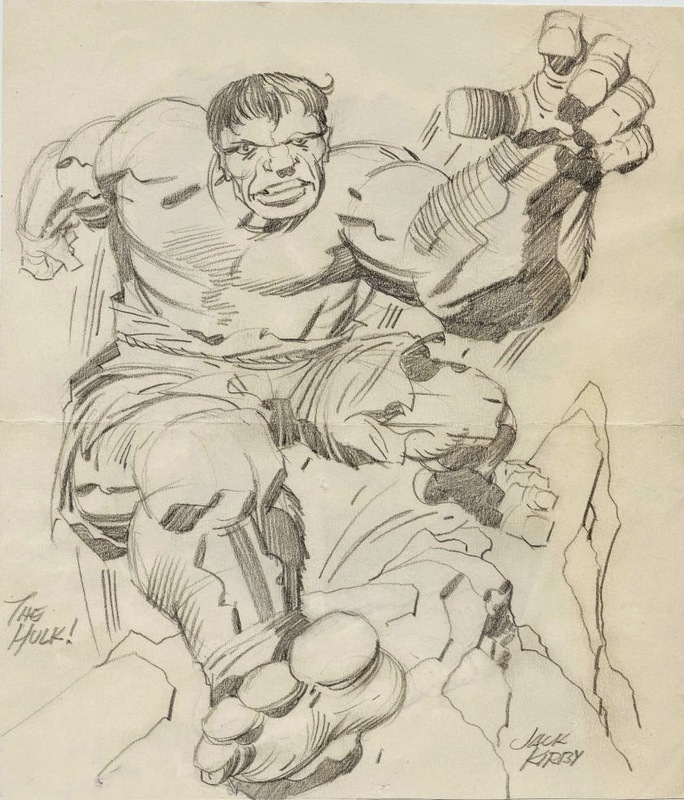 Also artists like Buscema or Barry Winsor smith though being more skilled into good anatomy portrayal had to work alot to obtain a similar depiction of POWER and ENERGY like KIRBY reached to do. In his youth Kirby worked as an in-betweener on the Fleischer Popeye cartoons, which focused him on movement. Anatomical concerns became secondary to gesture. As Nathan Goldberg observed, "Artists should utilize anatomy, not eulogize it." And it wasn't just about "power" for Kirby. By inclination and early experiences in the animation industry his concern was sequence and rhythm. He carefully, thoughtfully constructed the sequence that created that single moment of dramatic release--the "power" everyone focusses on--although by his high period a lot of that was ingrained for him. In his youth a friend of mine used to visit Kirby fairly regularly. He remembered one occasion when he and a couple of his friends were visiting with Kirby in his studio while he drew a Captain America page, listened to a talk show on tv and carried on a conversation with his visitors wherein he described the sequence he was working on which depicted Cap busting his way through a prison load of angry inmates. It was a "this follows from this" "this force causes this reaction, which in turn creates this response" kind of discussion whose summation was "It has to make sense." As an artist Kirby was a cartoonist in that it was all about the sequence, the story; something too few of his emulators grasped, saving all their love for the single "power" shot with the squiggles, power dots, and craggy fists three times the character's head-size. My friend and I kid each other about who was the best Kirby inker. He favors Mike Royer, and with good reason, not least being Royer and he were friends on a time; but I prefer Joe Sinnot, because of all Kirby inkers he was most sensitive to the graceful, even balletic line running through Kirby's figures, and took pains to emphasize that. Kirby liked to study actor's movements while he watched movies, but he also studied dancers for inspiration. If this grace seems to diminish by the time Royer became his primary inker, that's because Kirby noted Royer's strengths as an inker, and adjusted his drawing accordingly, because in the end it was the story that mattered most. Is that kind of humility anywhere among comic book artists nowadays? Kirby's pencils were very delicate. He had a lovely line in graphite which of course no inker is going to be able to save. Thus highlighting single inked "power" shots--Especially inked by Colletta--is to miss Kirby's greatest strengths, that lovely graphite drawing, and the fact that he sequentially built up to that single moment of COSMIC POWER from a probably very subtle, even intimate moment. That remains for me the key to his greatness; his ability to juxtapose the intimate and the cosmic in a single comic page. Is the KoolAid karaf still going around? Because it hasn't read my table yet. I'm trying to see the power in Kirby's pictures, but I can barely read them to begin with, and when I can all I see is the barely competent work of a highly obsessive teenager. And the Stuntman cover is supposed to show me that he can draw? Stuntman's right leg (our left) is tortuously broken, the knee is a mess of pseudo-anatomy, the woman's very muscular left arm (our right) is torn right from the socket and glued to the side of her head, the femur of her right leg looks to be about 4 feet long, and I don't even know where to begin with those horses; what is this mess? David, can you elaborate on power with some specifics? This post is about anatomy by the way so this is the aspect it's discussed here. But there's not only anatomy in Kirby work, it is only a small component of his art. From a mere anatomical standpoint its clear that Kirby invented alot the anatomy of his characters. Actually at a certain point of his career, he happened to invent a whole lot of things, for example palaces, cars,vehicles, guns and a whole lot more. This is beacuse in his comics the point was not realism, but giving to the reader the right impression, end emotions, and tell the story through drawings. In comics is reader's job to complete with his brain the work of the artist not the opposite. Artists filling their panels with a whole lot of details, despite looking good, actually somewhat steal the reader from the job he has to do, they limit his fantasy and imagination. So they do a bad work in this sense. Comics are not that. So what Kirby did, was to make his work as well and as fast he could do, telling the story through panels, yes even with lots of subtleties not everyone notices, to then explode in certain memorable panels. He didn't focus on perfect anatomies bacause too much realism can block the sequence, block the flow of reading. Nonsense from a comic book standpoint, for him. Then, emotions have to be well depicted both subtle and more clear emotions. So that's why the drawing of Kirby but not only his one, is abstract and stylized. Realism is at the bottom of his needs and interests and stylization is also at the end of a process in which he studied human body and movement and how to depict that with few strokes possible. Another great thing in kirby drawings is the sense of VOLUME his figures are highly volumetric, solid, they are never flat and give the sense of the mass and of their own weight and weight of objects and things they handle. There's a great sense of structure. Another concept regarding drawing is readability, which is important for a comic book artist and, with a stylized look, you obtain that more easily. For example, if you look to Alex Toth's works that is readability and good art though there's more respect for the human fugure and anatomy than Kirby, but his interests were more about adventures with normal people, not superheroes or fantastic creatures. So there's a bit less invention. Both Toth and Kirby were great comic book artists. Finally, Kirby was amazing not only for these aspects of his art but because he was very very creative so that he gave life to entire universes of characters we all can remember after many years. Daniele Mattei-- I think you are exactly right that "Kirby was a great comic book artist" and "the drawing style of his best years was like that: abstract, not realistic at all." In my opinion, neither Buscema or Barry Winsor Smith ever came within a mile of Kirby. The most interesting thing about this discussion for me is that 99 times out of 100, when a comic book artist draws inaccurate anatomy, we attribute it to lack of talent or time, or just not caring because the pay was so low. Yet, Kirby was that one in 100 whose inaccuracy may be deliberate, where realism was knowingly sacrificed for a higher cause. With Kirby, we don't mind. I would welcome any guidelines on how we distinguish the one from the 99. I will say I'm not so sure about your other point that "that's what comic book drawing requires." There were a number of greats whose drawing was realistic, not abstract (Alex Raymond, Hal Foster, Al Williamson, Neal Adams, Stan Drake, to name a few). I agree that part of their challenge was to make sure that rich details didn't "block the reader" and I think they succeeded. The Jerk-- yup, there's no doubt that Kirby knew how to choreograph a page. Sometimes that required individual figures to make sacrifices. Cory Hinman wrote:"it wasn't just about "power" for Kirby. By inclination and early experiences in the animation industry his concern was sequence and rhythm." I agree with that. I think Kirby was excellent with sequence and rhythm, although his forte seemed to be using sequence to crescendo toward that "single moment of dramatic release--the 'power' everyone focuses on." An artist can't have a perpetual climax; you have to retreat and build to convey power most effectively. I don't think I've ever seen the delicate, intimate line or the subtle side of Kirby that you describe. I find Kirby to be a brawny, muscular artist well suited for super hero comics but hopelessly out of his element in love comics or other projects that might require sensitive facial expressions, subtle gestures or delicate body language. His civilian clothing looks like it was made out of wood. The hair on his women looks like it was made out of clay (unless, like Medusa's, it has magic powers). So if you think I've focused to much on "power shots" to the exclusion of Kirby's "lovely line," it's only because I've never seen that line. Conor Hughes-- I think we can agree to disagree about the two "failures." For me, the failures confirm that what Kirby does is difficult-- he can't just draw arbitrary squiggles and rely on them to work out. Unless he pays attention, his abstractions can crash and burn. It proves his liberties aren't just random. I do think we have to be careful about the excuses we (meaning a number of commenters) make for Kirby. Sure, we can say Colletta didn't follow the pencils well, or that his wife Ros had no prior experience with inking or that convention drawings don't count or that Kirby didn't have the reference to rely on that other artists use, or that he deserves some credit for the fact that he had to work at lightning speed. But these are all reasons why critics of comic book art turn up their noses at this medium. They say, "OK, perhaps this artist could have done a great job if he weren't working with so many disadvantages, but why should we waste our time on a medium with so many disadvantages for an artist? Who wants to see a race horse run with 200 pounds of lead weights on his back? If we want to see what an artist is truly capable of, why not not turn to an art form that isn't so hostile to quality?" The greatest comic artists, it seems to me, make their peace with the limitations of the medium and find a way to achieve excellence regardless of the deadlines, reproduction issues, etc. I think Kirby did this. PS-- I'd say that if an artist finds that doing three pages per day interferes with their quality, sometimes it's their artistic duty to do only two pages per day. Back when Bernie Wrightson was inventing Swamp Thing, he put an insane amount of effort into each page. It couldn't have been very lucrative at the time, but decades later they are still a rock solid foundation for his reputation for excellence. Richard wrote: "David, can you elaborate on power with some specifics?" I agree that the Stuntman cover does not help Kirby's case at all. But I do think that Kirby's anatomy is genetically engineered around power. He draws thighs like tree trunks. They have unnaturally extended femurs. 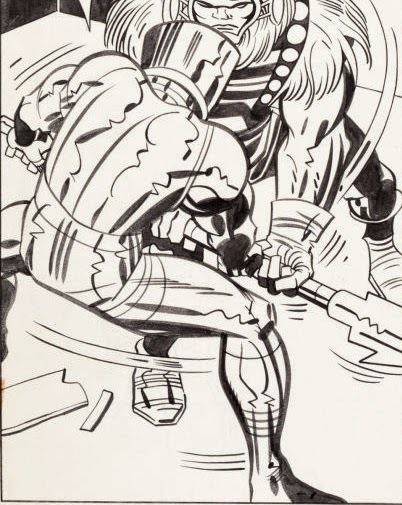 In place of the lines that a normal artist would use to convey leg muscles (vastus lateralis, rectus femoris) Kirby uses thick black slashing brush strokes, a compromise between speed lines and descriptive lines. In fact, most of his his body lines are streamlined, like reflections in chrome-- a technique he apparently perfected while creating the silver surfer and later applied to most bodies. I think this technique suggests a metallic strength, as opposed to the fragility of organic tissue. If you look at how Kirby applies that approach to back and shoulder muscles, his squiggles don't relate to ordinary anatomy, but enable him to heap up convex lines to exaggerate power in a way that Curt Swan could never do with Superman. His hands are often oversized, like blunt instruments. But more importantly, in his later years (the years that impress me the most, from FF #48 on) he was the best in the comic book biz at simplifying and amplifying power in his compositions. Bodies like coiled spring, blows delivered with great release. I was looking at a satirical story by Kirby the other day from Marvel's "Not Brand Echh" series. Kirby's efforts to draw "funny" were simply dreadful but the moment there was a blow delivered, you saw his real talent at work. There is a scene where a flying surf board hits Doctor Doom in the back of the head and drives his face through a tree, that is absolutely beautifully rendered. ( http://marswillsendnomore.wordpress.com/2011/09/15/not-brand-echh-first-issue-the-silver-burper/jack-kirby-stan-lee-not-brand-echh-fantastic-four-10/ ) Yet, the drawings immediately before and after it are puerile. David, after reading your response I'm getting a better idea of the degree to which Kirby was important in evolving how American comic artists depict power today. I'm not yet convinced his art is great art on its own, if you remove his context, but I can see why it was important for when it happened. d >" I'd say that if an artist finds that doing three pages per day interferes with their quality, sometimes it's their artistic duty to do only two pages per day." Boy, there's a lot of pompous in some of these posts. If you figure 8-9000 pages with say 4-5 panels on each, how can you pick a couple at random and compare them to Bridgeman? Also, the guy was feeding his family, I doubt he'd decide to do less just to make some people appreciate his work more. 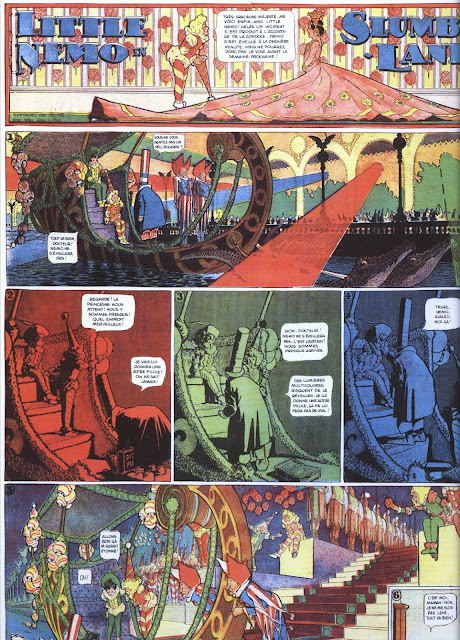 Richard-- Are you suggesting that Winsor McCay might qualify as one of the top 5 comic artists? Anonymous / Gary McCluskey-- When we say a comic book artist had to produce thousands of pages to feed his family, and couldn't take time to do a careful job, that plays into the hands of people who claim that comic books are an inherently inferior art form. A comic book artist may qualify as a wonderful father, but why shouldn't art lovers turn their attention to other art forms where the artist puts quality first? I'm not sure Kirby would thank you for your excuse on his behalf. 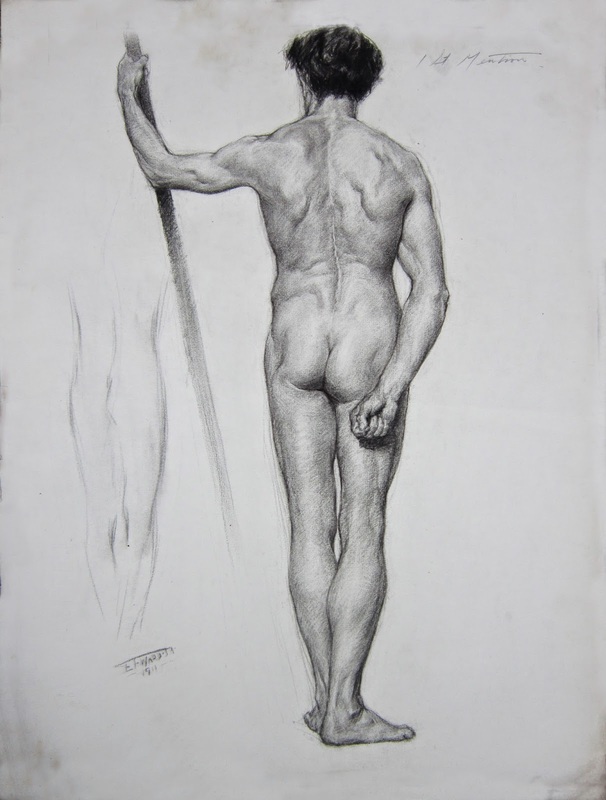 Also, lest you think my comparison was unfair, those life drawings were not by George Bridgman, but by a student in his life drawing class, E.F. Ward. Bridgman insisted that his students study muscle and bone structure, and that they observe the model closely. No, mostly I'm saying that this guy produced an amazing amount of work you can't pick a couple of random figures to compare to any artist who is working under a different system. And the term 'art lovers' to me misses the point again. If you're looking at his work for it's own sake, you can't really talk about his use of anatomy being 'wrong' it's a style developed for his own use. I'm still saying the comparison is unfair. If you want to find another comic artist to compare, it would make sense. Most of the negative posts seem to be saying I want these drawing to be the way 'I' like. You're critiquing it as something it was never intended to be and judging it when it falls short. And Kirby not thanking me for his 'excuse' is exactly what I mean by pompous. You're trying to dictate what 'art' is. How do you know this Isn't 'quality' especially when you consider this as only part of the piece - he was also writing many of these books. Anonymous / Gary-- Perhaps I was unclear about the point of this post. If I wanted to pick "a couple of random examples" of mediocre drawings by Kirby, that would not have been difficult (starting with the romance and humor comics discussed above). I have no interest in making Kirby look bad. What would be the point of that? The far more interesting question (and the one raised by this post) is how Kirby is able to make successful drawings employing inaccurate anatomy. What are the limits of his license? How far can he push it? And what are the compensating benefits that distinguish him from a thousand other comic artists who got anatomy wrong because (as you suggest) they were producing a lot of art for low pay? Those are serious questions worth thinking about, not some contrived horse race between Kirby and another artist. On the topic of my "unfair" comparison, if anyone has a legitimate grievance, it should be the young art student whose classroom sketch I've compared with the finished work of a mature, famous professional. I apologize to that poor student. If I had found a medical diagram showing the functioning of the muscles in that same position, I would have used that instead. I'm not sure I understand your use of the word "pompous," but just to show you what an open minded guy I am, I will add your explanation, "he wrote some of the stories," to the excuses, "he had bad inkers" and "he had to work too fast" and "he needed to feed his family" and "his wife was inexperienced with inking," etc. I guess I hold Kirby in higher regard than some of you. What Kirby is showing us is that a knowledge of drawing principles and extensive knowledge of one's subject are sometimes separate realities. With such simple principles as larger to smaller, long bold converging lines, strong straight lines, bold verses thin lines and multiple thin lines, an amazing amount of speed, strength and space can be created. The student anatomical drawing actually wanted more clarity in drawing principles which is why it looked like a student drawing. It lacked where the Kirby didn't and visa versa. Would the Kirbys have been better if the anatomy flowed along more accurate anatomical lines? Does the created anatomy lend itself to the created and imaginative world of super heroes solving the problems of order and fear with old fashioned definitive methods? The Kirby drawings are stimulating and provide a lot of things one could discuss or at least think about about regarding drawing. Thanks for another thought provoking post. "Are you suggesting that Winsor McCay might qualify as one of the top 5 comic artists?" "that plays into the hands of people who claim that comic books are an inherently inferior art form. A comic book artist may qualify as a wonderful father, but why shouldn't art lovers turn their attention to other art forms where the artist puts quality first?" I think, rather, it would be an argument against the economics of comics being published as high turnover serials. Few artists can work at that speed and still produce high-quality art, and I suspect most comics artists would feel comfortable with that characterization of things. "(starting with the romance and humor comics discussed above)"
You don't even need to go that far. This is an interesting post and subject. One ingredient I don't see being considered is that Kirby's primary concern is story. His anatomy choices come always in the light of what he's trying to say. Cropping any image or removing it from context of its page is as likely as not to eliminate some relationship that might explain why it "works". Also, between Kirby's early, unschooled work and his later abstracted work is a relatively disciplined/accurate period between doing Moon stories with Al Williamson, Sky Masters with Wood and his early issues on all the Marvel hero titles (particularly FF and Hulk titles, issues 1-6). You can see in that era an enviable command of anatomy, but he also employed his anatomic exaggerations to draw GIANT characters doing GIANT actions. Those are my favorite Kirby works. Mark-- Those are all fair points. I have previously raised a skeptical eyebrow when people try to justify mediocre drawing by claiming that story-telling pictures are somehow so different that they can't be judged on their appearance. (See about 500 debates over Chris Ware and others in previous posts). But Kirby is a genuine story teller, he never gets bogged down in details that impede the continuity. His distorted anatomy helps rather than hurts in that process, and the pictures (when he is good) are really good. While Wood's heavy inks add a form of "discipline" to everything they touch, he was definitely not my favorite Kirby inker. I'm proud to have contributed anything here. I admire this blog so much. I think Kirby's anatomy is almost always done as the answer to a storytelling question. That "spectacular fail" of Orion's bent arm above, with the strangely drawn bicep and straight line across it-- it's bad anatomy, sure. But it shouts (to me at least) that Orion is about to unleash a hell of a punch. Faced with the problem, "how do I show tons of pent up energy in a cocked fist?" Kirby's weird anatomy is often a solution. It took gusto to make it work. Kirby's end-tables, telephones, trees, buildings, and drapery were filled with a similar "fake anatomy" that conveyed energy. The gusto seemed to taper off toward the end of his career, but it was almost always clear what he was trying to do. One point that I've never seen mentioned in discussions of Kirby's anatomy is his abhorrence of negative space. In all of his drawings, he seems to be trying to position objects so that they fill every empty area in the drawing. If some corner or section of the panel threatens to remain empty, he will occupy it with a rock or bush, or bend or stretch a limb to fill it. In those and other such drawings, empty spaces naturally open up around the character in places unoccupied by the limbs. (Note the triangle of space at the upper right in each of the drawings I linked, as well as the space beside each near knee.) Kirby seems to take pains to avoid such spaces by gerrymandering Hulk's anatomy around the page (and by adding a mountain peak and the words "THE HULK" in places where he runs out of limbs). You'll see this same pattern in all of his work: every potentially empty space is filled, often by strange positionings of limbs or foreground elements. I don't know what his reasons for this might have been. Perhaps he felt clients weren't getting their money's worth if he didn't fill up the whole panel. Perhaps he'd misunderstood teachers' warnings against imbalanced pictures and compositional "holes." Perhaps he simply knew no other way to determine whether a drawing was "done." Whatever his reason, a result is that his characters' bodies end up in all sorts of weird poses that we don't see in other artists' work. And I think this adds to their power: by spreading figures so evenly over the available space, he makes them appear to dominate that space, much like a soccer goalie dominates a goal zone, or a spider dominates a web. It's not the smartest approach to composition, but it may be the most imperviable, which counts for a lot in the genre he helped create. Mark-- I agree that Kirby's great clarity was an important part of his success; there is no ambiguity or equivocation in his images. We tend to forget how important that is for a narrative medium until we see other artists grind the story to a halt because they can't resist adding garnishes and flourishes and superfluous fine lines (think Barry Windsor Smith). Jesse Hamm-- an interesting point, and one that hadn't occurred to me. Perhaps it is in the nature of Kirby's robust look that everything expands to fill the space allotted. 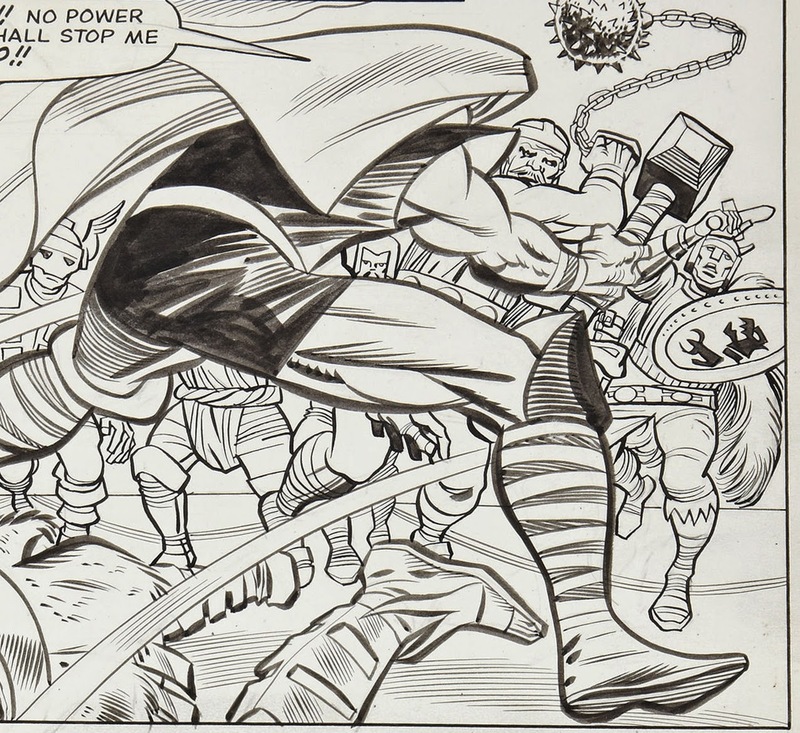 There was a time, fairly late in his work on Thor when it seemed to me that Kirby began paying more attention to composition (and thus to the design of negative space). I thought his work was better off for it. However, after he went to DC I think he returned to those packed panels you describe, where everything was bursting out of its space. David, I agree that great artists are able to surpass the limitations of their medium or possibly use those limitations as a means to thrive. I agree that Kirby in general does this. However that sort of ignores the issue that once Kirby has left his last pencil mark on the page, he essentially has no control over the final result. Coletta's work on Kirby can't be used to attack Kirby himself just as much as the product of someone tried to ink his work who had no prior experience doing so. While to some degree this allows a lot of wiggle room in terms of what can be used justifiably to judge Kirby's work, in general it really is hard to judge precisely being that the medium he was working in was inherently collaborative. Judging for instance his pencils, would ignore the fact that his work was intended to be inked and never seen in pencil form. Kirby is rather different in this regard to many other great comic artists. Toth, Caniff, Moebius all inked themselves. Lastly, that Kirby would limit himself to only 2 pages a day to bolster quality was simply not an option. It's a nice notion, but the fact of the matter is during the early marvel days (mid-60s) Kirby was essentially trying to save the company with his output. Kirby likely never considered himself an artist in the same sense as a fine artist, in this regard he has a rather american sense of being an artist, if anything, in the sense that his position is justified entirely by the mechanics of capitalism. I'll digress here, since likely this post won't be seen, haha, due to its late arrival. Well, I hate to differ from the general opinion here, but I think this idea that Kirby didn't use negative space should not be allowed to get any traction. 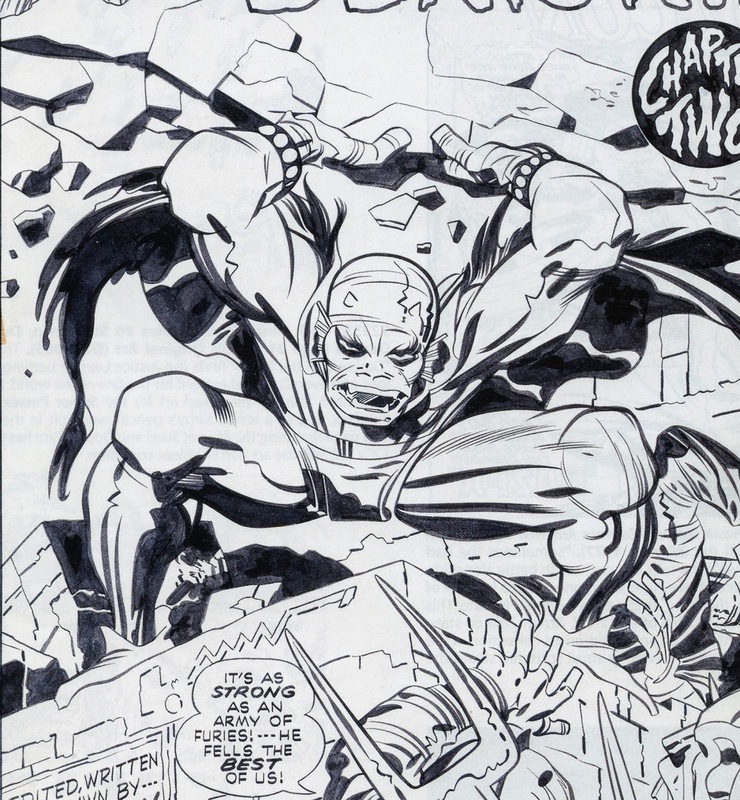 Kirby was a master at composition and negative space from around the time of Sky Masters to the end of his career. He was forced to use it from the start because of the medium. The simple truth is any professional cartoonist leaves negative space in every panel for copy-- word balloons, thoughts, etc. In comic books, you never knew where the letterer would put it (unless you scripted and lettered it yourself-- which Kirby never did at Marvel). Kirby not only used it, but his use of it led to Kirby tropes. In every issue, he would use panels without backgrounds or borders-- just figures in "floating space" leaving backgrounds to be implied by the context. His storytelling between panels would often depend on negative space if, for example, he showed something far away in one panel, then nearer in the next panel (another really neat Kirby trope). He was an artist with faults, but composition or misunderstandings of negative space were not among them. Conor Hughes-- Actually, you'd be surprised how many people continue to read these older posts. There's nothing topical about them, so last year's post is often as relevant (or irrelevant) as today's. It seems to me that much of Kirby's greatness stems from the fact that he understood the comics medium so brilliantly-- his exaggerations, simplifications, timing, etc. would not have worked as well if he was painting gallery paintings or religious frescoes. It seems to me that the disadvantages you describe-- the fact that "once Kirby has left his last pencil mark on the page, he essentially has no control over the final result" or "Kirby was essentially trying to save the company with his output"-- are the flip side of those advantages. If he is going to get credit for the former, he can't escape responsibility for the latter. Those are the pros and cons of the medium he chose. Yes, he deserves great credit for helping to save Marvel's business with the volume of his output, but that is a different virtue than being a great draftsman. Mark-- I agree that "any cartoonist leaves negative space in every panel," but I think the more important question here is whether a particular artist makes the outline of the form a design priority. Do they consciously shape the silhouette to form interesting compositions, or is the background merely what happens to be left over after the drawing is completed? Personally, I think there were periods when Kirby did indeed pay attention to those factors, but if we look at the examples of later Kirby work cited here by commenters (such as "The Jerk" or me) the negative space does not seem to be the work of a "master of composition." Well, if one cannot be a master all the time, is one truly a master? If someone draws a literal mountain of comic book pages and has a high ratio of masterly work, shouldn't we feel comfortable calling him a master? Even if lots of his work isn't up to his highest standards, it should not be his lesser work that characterizes him as this notion of Kirby "never" using negative space would. Lots of fake anatomy, but great storytelling and dazzling composition. And thanks again for the amazing blog! Remember that Kirby was a creator and story teller who was considering many things such the dynamic page composition as well as the flow of comic panels on a page to tell a story. In addition, he was creating super and inhuman characters and machinery from pure imagination. His short hand was a visual language developed because he was paid by the page. It is studied, copied and used by artists ever since. Man, Kirby was doing comic books. Telling a story from panel-to-panel. He needed to emphasize certain emotions, certain actions. He knew the basic content of a figure, but it was also cartoons, where you work on exaggeration to make your point. Compare his work, to say, Burne Hogarth's Tarzan, which is pretty anatomical correct if you are a well-build guy who works out by swinging in the jungle. But like his contemporaries, Gil Kane and Joe Kubert to name too, you drew for comic books which needed a certain dynamic cleanness to be printed on cheap paper and also hand-colored. You are looking at each panel of artwork NOT as a piece of fine art or perfection, but as a piece that is moving a story forward, capturing the interest of the viewer, and not boring them to death. If anatomy was the only important thing about drawing a human figure, I'd agree more with this assessment. But I don't agree, because Kirby was creating FANTASY. Not just stories, but larger than life stories. To this end his drawing also was larger than life. It was exaggeration and dynamics that ruled his pencil, not Brigman's or Loomis anatomy books. People love Kirby not because he's an artist from our childhoods, but because he redefined superhero comics. Not only did he co-create most of the BEST characters at Marvel Comics, but he also reinvented the wheel when it comes to comic book visual storytelling. Before Kirby, comics were by and large a lot of stiff figures and talking heads. Jack Kirby drew figures that exploded off the page in three-dimensions--literally leaping and flying at the readers. 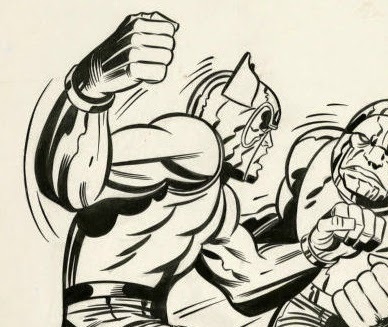 Kirby created action and dynamics that had not previously been seen in comicdom. When we think of superheroes, we think of dynamic, larger than life figures because of Jack. His panels and pages were exciting to look at. No, they were never masterworks of anatomy like Michelangelo, and his figures weren't realistic, but that was never his goal. To dismiss Kirby as some sort of faker is silly. A Cadillac isn't a hotrod. Kirby was a hot rod. Stop trying to compare him with other stock artists. He wasn't the norm for comics, and he's not the norm for art in general. His work had a unique voice all it's own, and unique is rare. Kirby was brilliant. You prove that because you still think his work manages to be credible, but it's clear that you have no real clue as to why. Many don't. You don't have to be an artist to get Kirby, but anyone working in the field of comics is likely to know why his work shines bright. If you don't know, you probably never will. That's fine and dandy. It's okay to criticize. Just go about it with a little more comprehension of the artist and his work. I agree with you, David, but next time I think it would be better to show examples of the pencil art when talking about a penciler, rather than inked examples. Not that Kirby's pencil anatomy was correct, either, but his inkers usually made extreme changes. Kirby/Sinnott, particularly, is often quite different than Kirby's pencils. The article sets up a straw man --anatomy-- and then proceeds to beat Kirby with it. *Art students* learn anatomy so they can understand what they're looking at in the live model, and represent that model accurately/artistically. *Cartoonists* are under no such compunction. They only have to draw what's needed to tell their story. As a kid (I'm only 41 now) Kirby art never appealed to me. But as I got older, and started drawing comic books myself (Nothing big, just small indy, and web comic stuff). I see the importance and the brilliance in what he has done. I constantly try to find the balance of "correct anatomy" and the interesting storytelling that make up comic books. As much as I like some more modern artists that are more anatomically correct. None seem to compare in my mind now, to what Kirby was doing to bring excitement, Dynamics, and powerful storytelling to the page. It's not an easy thing to do, and he seemed to excel at it. With a speed and quality that none since have been able to duplicate. Romita JR may be close in storytelling ability. But none have the powerful impact Kirby had. Kirby had a bold style, but I have to disagree that he did not understand human anatomy. He simply understood that he had deadlines to hit, and body language to convey to tell simple stories. He simplified forms a great deal, and made anatomy serve his ends instead of being a slave to it. Even Bridgeman, and Hogarth did this to some degree, as do all capable figurative artists in the final analysis (including Leonardo and Michelangelo) They went into more detail than Kirby, but they had different agendas than he did. What they have in common is using anatomical knowledge, instead of being hog tied by it. Kirby could not have done what did without a full understanding of anatomy. While still stylized his earlier work is much more accurate than his later anatomically hyperbolic Marvel work. The reason the work of many people who ape Kirby's style always looks wrong lays in the fact they are copying his highly stylized anatomy without the underlying knowledge of why it works in the first place. Colletta was a hack. He destroyed Kirby's work, i feel pain every time i think about what Thor could have been. That guy couldn't cleary grasp what Kirby was doing. He understood everything perfectly , this are just some sample of when he was drawing for action , intention, attitutde , he was long done with his phase of showing good anatomy , he stoped carying for the sake of power/energy/impact even in the late 40's. That Hercules proves nothing, Colletta destroyed the Kirby design with his crude amateurish inking. Thank god for photography. Art helps me see nature and nature helps me see art a little better. I like all of Kirby's art because as a kid it moved and was powerful. Many inkers enhanced Kirby's work. I liked Colletta on Thor because he softened the garrish work of Kirby (not all was garrish just some). But Kirby did change over time. From Fantastic Four #1 to #36 he kept getting better and better and it was more and more exciting. My guess is is that comic fans get imprinted by the first artist they are exposed to in comics. And they become the style they most like. I could be wrong. Just a working hypothesis. Though I always loved Ditko, Kirby and Wood, and Curt Swan and Gil Kane because they were my earliest favorite artists. Liked Crandall but he seemed sort of stiff. Loved Frazetta and Al Williamson, Hal Foster and Alex Raymond from day one as well. Some inkers help out some artists. Dan Adkins was a great inker. When Wood inked Kirby I loved it. When Ditko inked Kirby it was precise and focused. Colorists matter immensely too, I feel. Oh Boy! Well here it is..The reason why its so hard to make a living as an artist, musician, or writer today.. Everybody is a critic and they think they know about any of the above stated artforms.It is not easy to do.. not everybody can draw okay I guess you would have to have a photograph instead of a drawing or painted image to convince people in your comparison.Ridiculous.. and what is wrong with spending hours on a drawing or painting? (Guess these people have something they want to do more important? If so then that's why they are not artists and cannot be?) I enjoyed your comparison and agree with your conclusion. The worst piece by Kirby is still 10 times better than the best piece by Chris Ware. I'd feel a lot more comfortable if you used actual Kirby pencils instead of items inked by the notoriously eraser-happy Vince Colletta. This is not actually Kirby art so all arguments are invalid. You need to educate yourself on the workings of the industry of comics before doing unfair comparisons. You keep overlooking the fact that Kirby was the fastest pencilers of his time and the fact that he didn't work from a model, just his ample imagination. Wonder how much time the student used on the image you present? What would it look like if a novice inked it? A pro? Comics also had restrictions to detail. Feathering and great detail don't show up. Put some Kirby pencils up (which haven't been inked) and try again. Or don't. This is apples to oranges and shows your ignorance of an industry you pretend to know about. Kitty Trundle-- Let's just say I agree that Kirby is a superior artist to Ware. Captain Blog-- The only fans who get overheated faster than Frazetta fans are Kirby fans. I assume you realize that only one of the many examples of Kirby's work was inked by Colletta? Hardly enough to conclude that "all arguments are invalid." Most amusing of all is your notion that Kirby should be exempted because he "was the fastest pencilers of his time." That's an honor comparable to "loudest poet" or "tallest singer," isn't it? Disrespect Jack Kirby and disrespect yourself. He was an illustrator's illustrator, the greatest comic artist of all-time, and a true professional. Scrutinizing his adherence to actual human anatomy is entirely missing the point. He made changes and used shorthand to communicate dynamism and err on the side of excitement. Humbecker is absolutely correct. I've studied figure drawing and taught art for a few decades now, and I can say with confidence and a little authority that an artist must understand anatomy supremely well to stylize it so convincingly. This kind of thing cannot be faked, as evidenced by most anime and manga, stylizations based on previous stylizations, where awkward foreshortening and dependence on a library of visual shortcuts betrays an egregious lack of formal art training. I haven't read every word of the short novel's worth of comments above, so this may have already been stated, but Kirby extruded a sound knowledge of anatomy (and perspective/composition/design) into a explosively powerful depiction of the essence of movement--that is the understructure of his mature work. He wasn't attempting to draw dissecting-chart anatomic accuracy, he was translating into line drawing the physical sensations of weight and mass in motion against gravity or other resistance, leading him deep into the realm of abstraction and pure design. To hold him accountable for accurate anatomy as a value judgment is to completely misunderstand his work. It is as foolish as demanding that the anatomy in animation be technically correct--who would want to see realistic animal anatomy and proportions on Bugs Bunny or Daffy Duck, or text book human anatomy on Cruella Deville or The Incredibles? One thing Kirby understood viscerally is that comics are meant to be drawings of motion, not drawings of static moments. 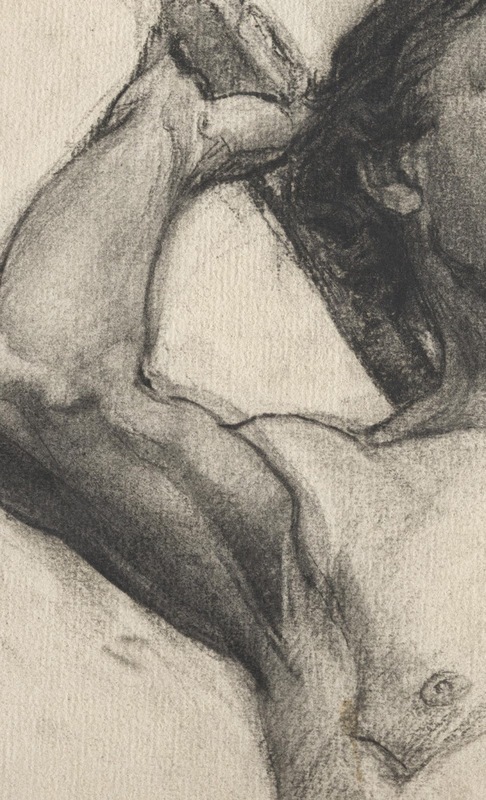 So he drawings of muscles should be seen as frozen in time. They're impressions of how muscles move. There seems to be a real desire here to confuse Illustrators with Cartoonists. Jack was a action cartoonist. He drew for effect, not realism. He was trying to convey mass, speed, motion, time and power in a static medium. You might as well have posted a comparison of Road Runner drawings by Audubon and Chuck Jones. There are no short cuts. Well done. I think one of the big reasons that Kirby's anatomy worked, even though it didn't at times, is because he had such strong silhouettes. His silhouettes read instantly, and the big masses were in place...which I suppose allows our brains to give him a pass on muscle placement. Like Bob Rivard said above he was an action cartoonist. It's almost as if Kirby's panels were a freeze frame out of Looney Tunes or Termite Terrace. The thing of primary importance is to create a compelling drawing that makes me want to spend my lunch money on your comic book, regardless of what a deltoid does. Let's look at Rob Liefeld who was popular for no good reason and had neither a good understanding of anatomy or any idea of what composition is.